Danlink Ingredients (Pty) Ltd was established in 1997 as a subsidiary of the Danish company Danlink International ApS. The owner, Bjarne Nygaard Pedersen, spent part of his time in South Africa during the first years, slowly developing the company, targeting primarily the international food and flavouring companies. As the company grew and expanded into the local food industry, more time and resources became necessary to provide the level of service which is, and will always be, what separates Danlink from its competitors. 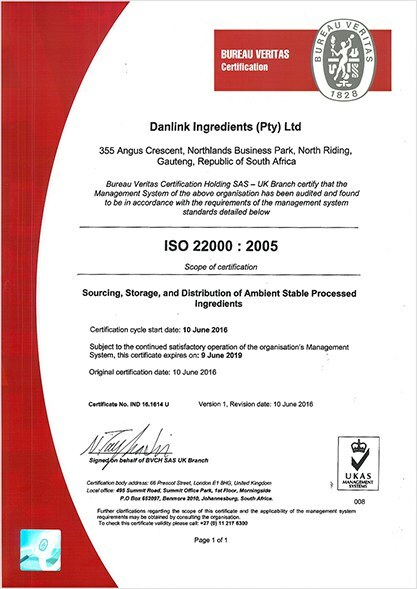 A partner, Carsten Hovgaard, was therefore brought into Danlink Ingredients, securing our continued growth without sacrificing our service to our customers. Danlink Ingredients is an agent and distributor of specialty ingredients and additives to the Food Industry. We only represent reliable and reputable manufacturers who can give us the back-up needed for us to give our customers a world-class service – technically as well as commercially. We prefer to concentrate on specialty products; but when requested by our customers, we can also provide commodity type of products in bulk. Local manufacturing and formulation are constantly evaluated and will be implemented whenever found feasible.